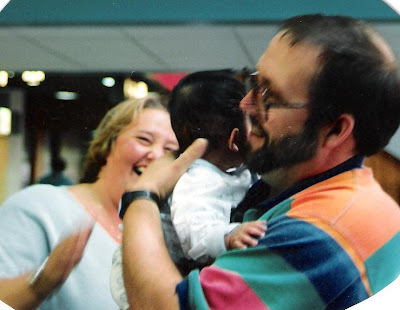 Fourteen years ago today, this was the scene at the international terminal at our metro airport. It was the hand off of the smiliest, cutest little bundle of Korean joy ever. He had a head full of hair, one deep dimple and eyes that totally disappeared when he smiled. I had gotten him first….and then my Mom…..and finally his Dad. Best way ever to give ‘birth.’ No spinals. No stitches. No ice chips. Just open your arms and BINGO. Instant parenthood. Unconditional love. Right from the get go. And today, this was the scene at another of our favorite restaurants. Same kid. Same dimple. Same Dad. Same head of hair…not. Parting with previous ‘Gotcha Day’ traditions (pick of places for dinner, choice of a family activity), this year we gave him a ‘gift.’ Five whole days of being an only child again. Sigh. TODAY was the day we dropped his sister off at the greatest summer camp EVER. Dad is home from work. Mom is off on summer vacation. Okay, so it wasn’t actually PLANNED this way but I am a ‘seize the moment’ kind of gal. Opportunity unexpectedly arose. Besides, the agenda now is to smother him with so much attention and affection so he will actually be GLAD to see the Princess on Thursday.